Chicken Soup for the Soul, 9781611599510, 400pp. One person can make a significant difference in the lives of others. This collection of 101 inspiring stories celebrates volunteers and those who give back, and also shows how the biggest beneficiaries are the givers themselves. Volunteers and people who give back are models of unconditional kindness, compassion, and love. You choose hope over despair, optimism over cynicism, and caring over indifference. And by serving others, you also help yourself. 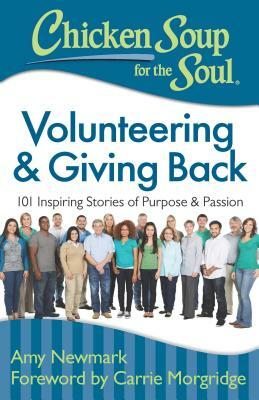 In this inspiring collection of 101 personal stories by and for volunteers and those who give back, you and your fellow unsung heroes will get some of the recognition and appreciation you deserve. Amy Newmark is author publisher, and editor-in-chief of the Chicken Soup for the Soul book series. Carrie Morgridge is vice president of the Morgridge Family Foundation and has completed multiple Ironman competitions. She and her husband, John, have headed the Morgridge Family Foundation for fifteen years.